Discussion in 'Icons From The Past' started by jexxica, Apr 30, 2009. I can not believe she does not have a thread yet. I know, but I can't remember. That's why in the 2nd post I was more specific. 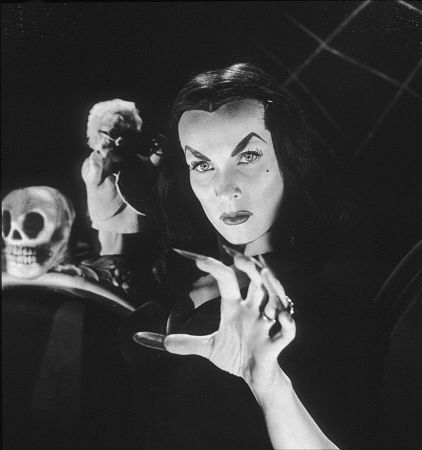 Was Maila Nurmi her real name? 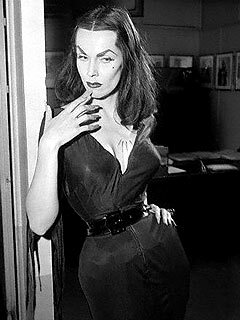 I believe it is Alaine Maila Nurmi from what I gather. i'm not too familiar with her so if anyone has more information, i'd appreciate it. She was Elvira before there was an Elvira. She was also friends with James Dean and was in an Ed Wood flick. Wikipedia her and you will find info. I have never heard of her, interesting. Usually Finnish papers keep in mind everyone who has Finnish roots and has had even some kind of success over the sea. So she was a model/actress? 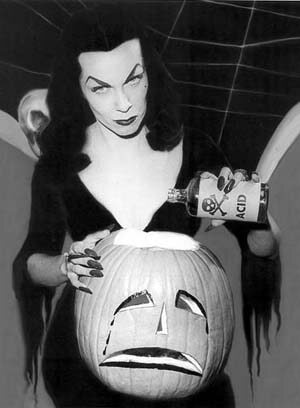 looove Vampira! the best thing about her was her personality, you should really watch some of her interviews on Youtube, she has such a good sense of humor and tells lots of great stories about old Hollywood (she claims Orson Welles gave her "the clap" and complimented her by telling her she had a "magnificent carcass! ").